Portuguese League Attendances are pathetic! Soccer will probably be the most popular sport in India within 10 years. The new Indian Super League, with big stars, will help a lot. MLS still has a long way to go to become the biggest sports league in the USA/Canada. Nicola1975 and Zxcv repped this. Soccer will probably be the most popular sport in India within 10 years. The new Indian Super League, with big stars, will help a lot. That's assuming ( a ) it actually happens (it has been delayed once, a similar league recently never got off the ground) and ( b ) there are actually "big stars" who actually play, instead of just allowing their names to be linked to it in the press. Even if those things happen, that's very ambitious. Cricket is truly massive in India. Yes, highly unlikely that a ramshackle league with few actual "stars" will, in ten years, be transformative enough to displace cricket. Sport space doesn't usually get rearranged that quickly in most nations. Cricket seems to popular in some regions only. Any sport which has a record crowd of 131,000 must have a degree of popularity, but yes, it's difficult to see cricket being dethroned. The IPL might have been a massive success, bit it's much easier to get worldwide cricket stars to sign deals with IPL clubs that it would be for football. Wow, who cares if cricket gets dethroned in India? Does anyone see baseball crying about its position behind the NFL? What about basketball? Are they shedding tears over not being number 1? No, they remain popular sports with mass cultural appeal. Whether soccer is number 1 or 2 in India in 1000 years time is irrelevant. What it needs to do is improve its position as number 2, and despite the appeal of Kabbadi and hockey, everything I see points to soccer being number 2. Get to the point where its the equivalent of being the MLB in India - a rich, popular sport that people don't see as foreign but theirs. I like this map. Whoever did it knows their stuff. Two things I'd counter. Estonia being labelled as a basketball nation is the first. I think its way closer than that, and I would put soccer ahead actually. The second is Cambodia being labelled a volleyball nation, again I think its first and foremost a soccer nation. I made my own map a while back. I've come across this thread and feel like this is the perfect place to put it. While I like that map for showing the different sports that dominate around the world, my map looks at places where soccer is number 1 or 2, which I think helps show just how few nations there are where the game hasn't penetrated into mainstream. 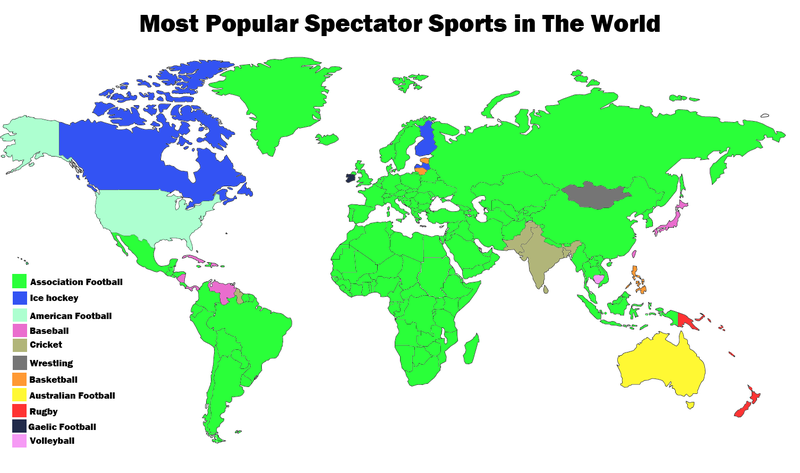 I feel that if you are the first of second most popular sport in a country, you are doing very well. After the first two, the national importance seems to drop heavily, wherever you look. Basketball in America is probably the one exception to this. I can't find another country on this planet where there are 3 sports that have the cultural weight of football, baseball and basketball in America. Maybe Australia, although Australia is very unique in that it isn't really a single cultural entity when it comes to sport. Due to its size and separateness, two equally dominant sports (Aussie Rules and rugby league) sprouted in two different parts of the country, while cricket has a more national appeal rounding off the top 3. For me there are 3 nations where the game still has a long way to go: United States, Canada and Australia. I'm not worried about China or India where its number 2 (though the gap between basketball and soccer is China is much smaller than people think). Those nations will evolve to have an incredibly powerful soccer identity, because they dont have the barriers to entry like the US does, and because soccer is already rooted in both countries in a way that it isnt in the US. Even if soccer is the second most popular sport in the two countries with the highest population, China and India, neither of them has a great national team in the FIFA Rankings. Indonesia, Thailand, and Pakistan are other Asian countries with many people but not great national teams. Thank you for these statisticals. I hope that you can upload us even on the attendances of the Pakistan and Bangladesh clubs and above all to put the attenadance ALSO of the leagues beyond the clubs. I use WorldFootball.Net and www.european-football-statistics for attendance information and both are excellent sites from which extensive data is quoted above and this data seems reliable as it is consistent with other sources. I have always found African data, except for South Africa, very difficult to find and so I am interested - from where has the data for Algeria, Egypt, Morocco, Tunisia, Nigeria and DR Congo been obtained, to which season does it relate, and how reliable do we think it is? Hard to break the Dortmund Yellow Wall! This year great attendances also in the Chinese Super League. What is the attendance in there?